Maurice Bryan's CRAI Letter to The Irish Times. One must agree with the excellent points made by Rosie Cargin (January 5th) emphasising the cost and other implications of proceeding with the proposed Poolbeg incinerator. Prof Vyvyan Howard gave evidence to the Environmental Protection Agency hearing, on behalf of Combined Residents Against the Incinerator, about the implications of pathogen transfer by micro-particles and the potential danger to surrounding communities. This was amplified by disquieting evidence from Dr Stefano Montanari, an expert in this research. This alarming aspect appears to have been largely ignored by both Bord Pleanála and the EPA. However, the EPA, in granting its licence, imposed stringent conditions on the operation of, and discharges from, the plant, which cannot of course be evaluated until it is built. This means the entire construction expenditure may be set at nought, and the facility may become a “white elephant” to dwarf the electronic voting machines. 1. The planning process under which permission was given was a “hybrid” that fell between the normal process and the Strategic Infrastructure Act, and which is of doubtful legality under EU law. Its legitimacy is shortly to be challenged in the courts. This could overturn the planning process. 2. The 600,000-tonne proposed capacity was originally selected on two postulations – that the eastern bypass road would be open before the incinerator was built, and that the population of Dublin in 2020 would exceed two million. The road has been abandoned, necessitating a complex traffic plan whereby most of the waste will travel by the M50 and back through the Port Tunnel to Poolbeg. The population prediction was also clearly flawed. When the recent judgment confirming the right of the private waste collectors to ownership and disposal of waste collected by them is added, it is clear the amount available for the plant will fall far short of the 320,000 tonnes guaranteed by the councils, so that penalty costs will be incurred. The result will be that bodies like Dún Laoghaire-Rathdown County Council, whose waste is collected by private firms, will still have to pay their share of the compensation, doubtless to be levied on citizens in addition to collection charges. Council waste charges will naturally have to rise considerably. 3. The council’s consultants stated at the planning inquiry that the incoming waste was liable to spontaneous combustion, especially as it would be unsorted. This makes it doubtful if the trucks concerned could go through the Port Tunnel. They would certainly require special provisions. This negates the council’s statement that there would be no congestion on Seán Moore Road. 4. At full capacity, the plant would produce 10,000 tonnes per month of toxic bottom ash. This requires treatment before it can be sold as road metal (for which there appears to be no present market). The original proposal was to ship it abroad, a process strictly regulated by EU law and which may not be allowed. It beggars belief that, at this stage of the project, there is no clarity on this major part of the process. Perhaps these concerns will serve to convince your readers that someone, somewhere, (possibly even the Government) must be able to stop this gratuitous waste before it is too late, before irreparable damage is done. http://www.irishtimes.com/letters/ Thursday, Jan 14, 2010. Emphasis and links have been added to the original letter. No other omissions, additions, spin, re-wording nor influence has been done. This honours Dublin Council's Mr Twomey's massaging of Poolbeg Reports. "Letters to the Editor". 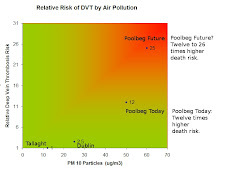 Dublin Council/RPS Credibility - Incinerator Health Effects. Unpublished/Under Review by Irish Times. Jan 16, 2010. "Massaging of reports by Matt Twomey, which were later, in their edited versions, released publicly, is a strong indicator to me of unacceptable influence in a process supposedly carried out in the public interest," - Judge McKechnie. [Section 173, Judgement Part 3, Page 13 of PDF file unapproved judgement p3.pdf ]. "There is no credible evidence that modern incinerators impose any risk to health." Has this bare opinion by Mr Rudden been peer-reviewed? The phrase is curiously similar to the repeated phrase by the eight CEO's of the Tobacco Industry before the US House of Congress/Senate, before they were fined literally hundreds of Billions of dollars. 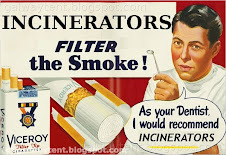 Replacing the wording 'modern incinerators' with 'filtered tobacco' confirms the intersecting universes. Incineration exposes Ireland's taxpayers at a rate of $8 million per premature death now that the signature of each micro-particle is traceable to its site-specific source. That could be $2,400,000,000 per year for Dublin. Is it Mr Rudden's opinion and the opinion of RPS and of Dublin Council that the British Society For Ecological Medicine, Prof Vyvyan Howard, Dr Stefano Montanari and others are not credible? Have any of Mr Rudden's other opinions published in your newspaper on 12/10/2010 been peer-reviewed by a credible source? Mr Rudden's usage of the phrase "modern incinerators" implies effective management of the facility, otherwise there will be dangerous pollution causing premature deaths across Dublin. * The neighbouring DCC managed sewage facility is still producing hostile chemicals, a sign that DCC facility management can not be trusted. * Water leakage rates in Germany are 3%; in Ireland the reported rates are something like 47% (Cork City). * The EPA stood by while Cork Harbour was polluted with Chromium-6. * The Rutgers Law Centre reports the proposed USA-operator chosen by DCC has been fined for dioxins releases at all of its incinerators in its home state, New Jersey. Its "old" incinerators trading as Ogden have been fined literally thousands of times. Why should any Dublin resident trust Dublin Council with their health and the management of a dangerous facility - especially with DCC's observably kaotic facility management record and their judged massaging of the whole truth? A fully truthfull answer, without omissions or spin is appropriate, especially following Judge McKechnie's unapproved judgement concerning the 'massaging' of RPS reports by Dublin Council's team concerning the Poolbeg waste-to-toxins/incinerator. 'Objector' at An Bord Pleanála and EPA Oral Hearings, 2007, 2008. Member, Sandymount & Merrion Residents Association.